I was reared in a tradition that scorned written and read prayers. Book prayers. Dead prayers. Reading a prayer would have been like meeting an old friend on the street, quickly leafing through a book to find an appropriate greeting suitable for the meeting and then reading, "Hello, old friend; it is good to see you again. How have you been? Remember me to your family. Well, I must be on my way now. Goodbye." And then closing the book and going down the street without once looking my friend in the eye. Ludicrous. The very nature of prayer required that it be spontaneous and from the heart. But along the way, I began to come across books of prayers that gave me words to pray when I didn't seen to have any of my own. I found that books of prayers sometimes primed the pump of prayer when I didn't feel like praying. And I found that, left to myself, I often prayed in a circle, too wrapped up in myself, too much confined to my immediate circumstances and feelings, and that a prayerbook was just the thing to get out of the brambles and underbrush of my ego, back out in the open country of the Kingdom, under the open skies of God. In the process of discovering, to my surprise, alive and praying friends in these books, I realized that all along the prayers that had most influenced me were written (in the Bible), and that the lively and spirited singing we did in church was, for the most part, praying from a book, the hymnbook. My world of prayer expanded. 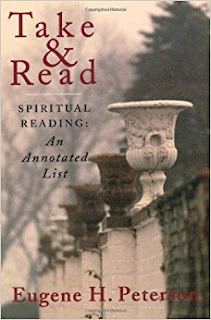 - from Eugene H. Peterson, Take & Read: Spiritual Reading: An Annotated List, 22-23.